RM-HD1 Reference Monitor 3G/HD/SD-SDI Expansion Card. 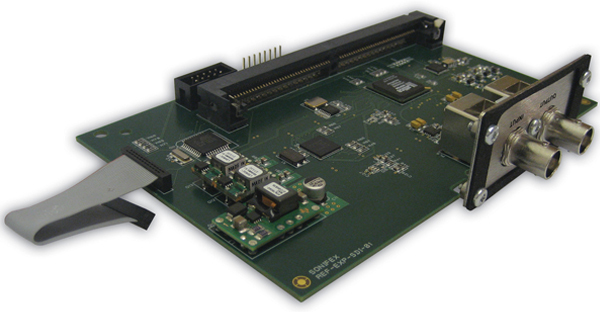 This expansion board allows the monitoring of embedded non-encoded linear PCM audio channels within an 3G/HD/SD-SDI video signal. The RM-HD1 card can be used with the RM-2S4, RM-2S10 and RM-4C8 monitors. The expansion board can extract any selected AES/EBU audio group (4 channels) from the video signal and pass them to the main Reference Monitor unit for monitoring. Any group can be selected and can also be optionally delayed by up to ~300ms by using the Sonifex SCi remote control software. All channels in the selected group can be monitored visually and 2 channels can be selected to be monitored on the speakers (for the RM-2S4 and RM-2S10, stereo pairs are selected; the RM-4C8 allows any 2 channels to be monitored). The input is auto-sensing for either SD, HD or single link 3G input formats and the extraction of embedded audio complies with SMPTE-272 (SD) and SMPTE-299 (HD/3G). The SDI input is equalized, internally re-clocked and re-transmitted to provide a re-clocked output to pass to external equipment such as another reference monitor.